Those of us that are engaged in a fierce battle with acne have likely already discovered one of its main causes. No, we are not talking about genetics, sun exposure, the quality of store-bought products or hygiene. A primary, inherent cause – and therefore solution, of acne can be recognized in the face of one’s diet. Indeed, the things you eat, and their concrete nutritious value, can have immense effects on your system. Why should it not be the same when it comes to your outer appearance? Berries are famous for its ability in protecting your skin from damaging effects of the sun because it is packed with antioxidants. Diet is an underrated but significant cause of recurring breakouts. You truly are what you eat. One of the main components of your diet that can either make or break-out your skin are fruits. The key is to know which fruits can benefit you more than others and focusing on ingesting as many of them as possible. It’s as simple as that. Why does it matter which particular fruits you eat? As you may know, a downside to binge-eating fruits is the sugar that they stuff your body with it. Granted, it’s delicious and natural sweetness, but it is still just that – a whole bunch of sugar. In fact, sugar is one of the main pimple-causing culprits. Sugar contributes to heavy inflammation and it makes you more resistant to insulin. For that reason, rule number one is to actually go ahead and study the fruit that you are eating – is it high on sugar? The second step is to explore the beneficial characteristics of each type of fruit that you are considering as becoming your go-to fruit against acne. Just as fruits differ in sugar content, they also largely differ in their content of healthy ingredients. Some specimens will boost your antioxidants and phytonutrients and others will increase your body’s ability to fight irritation. Yet others will not provide you with nearly as many healthy properties. Know what you are putting into your body. We have therefore compiled a list of several different fruits which can bring you the utmost benefits in relation to your skin condition. Our favorite summer fruit of choice is the watermelon. Its uniqueness as a fruit and as a nutritious additive to your diet make it an ideal place to start in terms of your fight with pimples. Although water makes up a significant part of this fruit, it is also filled with healthy amounts of vitamin C and l-citrulline (an amino acid). Both the flesh and the rind are edible, but it is the juicy part of the watermelon that provides you with all of its benefits. Indeed, the more ripe and red the fruit is, the more benefits it can grant you with. The best part? Even if you opt for devouring 500 grams of the fruit in one sitting, you will only have gained 30 grams of sugar. Granted lots of fruits can provide you with vitamin C. But the l-citrulline is a more unique part of the watermelon’s buildup. Basically, this amino acid easily changes into its l-arginine form, which is a primary component of nitric oxide. The latter is basically a top-notch aide when it comes to repairing skin and remedying all kinds of wounds. This means that it can be your best friend if you happen to be striving to heal your complexion from the leftovers of past breakouts. Another excellent aide in the fight against acne that can be provided by watermelon is the fruit’s hefty supply of lycopene. This ingredient, which can also be found in tomatoes in smaller amounts, expertly diminishes inflammation and rids you of skin irritation. As mentioned, it is best to eat the watermelon when it is as ripe as possible. This is because the more ripeness in a fruit, the more lycopene content it brings to the table. Unlike bananas, which become less healthy as they ripen, the watermelon becomes better with age. When should you opt for watermelon? Go for it if you are currently fighting inflammation in the form of a current breakout. Do opt for it in the case that you are feeling a need for more nutrients in your diet. Most importantly, grab a nicely ripe watermelon slice if you happen to need a remedy for skin that suffers from signs of old zits. The strawberry is another excellent fruit which can help you deal with skin problems. It is loaded with plenty of vitamin C – if you stock up on these berries, you basically need no additional source of this vitamin. For instance, in comparison, while raspberries can also supply you with plenty of antioxidant power, they provide your body with a lot less vitamin C.
One of the important values of vitamin C is that it diminishes your cortisol – which is the hormone that brings you stress. As a lot of acne breakouts tend to be caused by stress and daily tension, this is definitely a cause for celebration. 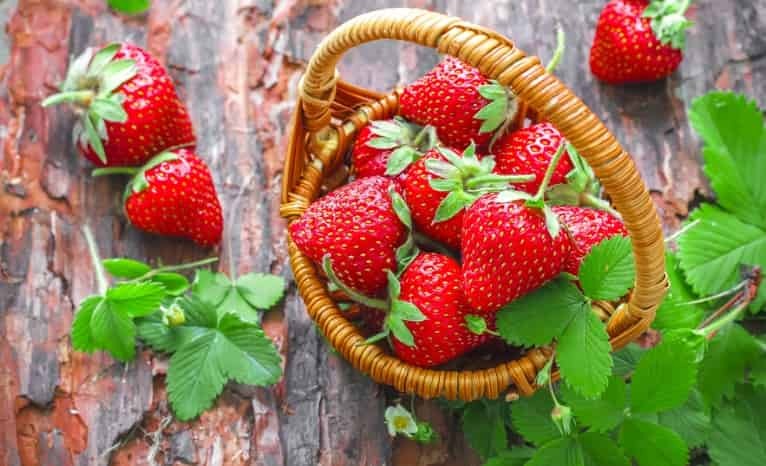 Significantly, as the body takes in components of certain foods more easily than when they come from others, it must be said that strawberry’s benefits are very easily absorbed. What is more, strawberries’ antioxidant levels are very high, therefore you can be certain that any inflammation you have will be minimized in no time. Say goodbye to free radicals! One experiment tested the effectiveness of strawberries for skin by daily feeding test subjects half a kilogram of strawberries for the duration of a month. The results showed that free radicals for most people had pretty much become a thing of the past. To be sure, their malondialdehyde levels (biomarkers employed in peroxidizing lipids) had gone down to an average of almost 31 percent. How does this relate to pimples? Essentially, as free radicals are the particles which help the sebum in your skin become oxidized (building up a substance named squalene peroxide), the less you have of them, the less active oil you will have. Of course, this means that the whole process results in less material available to block your pores. It sure sounds good to us. Remember to look for ripe, richly red strawberries – these are sure to be full of antioxidants of the anthocyanins type. Less ripe berries would unfortunately not contain as much of this worthy ingredient. What is more, make sure to eat the fruit within several days of purchasing it, and ensure that it is kept in the fridge. After a little less than a week, strawberries begin to slowly lose their full antioxidant potency. In terms of keeping away from fruity sugar, you can rest assured that you are on the safe side when it comes to strawberries. A kilogram of these berries only contains about 50 grams of sugar. Basically, if you are seeking a low-fat, low-sugar, super healthy option that is full of antioxidants, don’t forget to stock up on some fresh strawberries. There is a reason we focused on strawberries – they are simply the healthiest fruity option of its kind that is good for fighting acne. Still, other berries have their merits, too. In general, you cannot go wrong with grabbing a plate of tasty, fun-to-eat berries if you are trying to minimize a breakout. Raspberries, blackberries, blueberries, etc. are very potent aides for diminishing acne. Most of them contain tiny amounts of sugar (blueberries being the exception, at 50 grams for every half a kilogram). All berries can enrich your system with plenty of phytonutrients that expertly battle any irritation, as well as with all kinds of antioxidants. Naturally, all berries are filled with various healthy components, such as tons of vitamin C, magnesium and calcium. And these are only the benefits that are known to us at this point! Notably, beside helping you rid yourself of recurring pimples, they are likewise marvelously powerful agents when it comes to other kinds of conditions, as well. One such condition, that happens to also be related to acne, is resistance to insulin. The ketones in raspberries help regulate your insulin, simultaneously decreasing the activity of your sebaceous glands – leading to less oil in your pores. A similar effect can be achieved with blueberries. This was proven by scientists who had a group of obese test subjects ingest bioactive ingredients of these berries. Indeed, the subjects’ insulin levels became a lot more easily regulated. A really great thing about berries is that they truly are widely available and easy to obtain. In fact, you don’t have to limit yourself to store-bought berries. You can probably even find all kinds of awesome-tasting, and very healthy, berry varieties all around your neighborhood. Indeed, as long as you make sure that the berries that are growing on a particular bush aren’t poisonous, you may indulge in picking a bunch of them and having them for breakfast in combination with your morning yogurt or pancakes. You can also pick some on your morning jog and reward yourself with a handful of these goodies once you are done running. While you should definitely check whether or not the berries on your fruity bush of choice happen to not be good for eating, don’t worry if they seem more bitter than usual. The more bitter they happen to be, the more anthocyanins they contain. If you aren’t ready to take the risk of picking berries yourself, try to go for the organic variety that is sold in stores, so as to avoid ingesting a bunch of pesticides, inflammatory or carcinogenic materials. As a result, you might just notice a general boost of your well-being, mood and general health, in addition to an improvement of your skin. A funky fruit that you might want to opt for if you are battling acne is the pomegranate. Its unbelievably rich in antioxidants – about double the content of blueberries and raspberries, more than twice more than strawberries and a lot more than other goods such as bananas. Thus, if you feel like unblocking your pores, just opt for some pomegranate seeds. Particularly, this fruit can provide you with excellent levels of anthocyanins – as evident by its color and flavor. When shopping, go for the darkest, most red pomegranate you can get your hands on. Although they contain some more sugar than we’d like, one great benefit of pomegranates is their ability to reduce stress. One unique fruit that can help you fight recurring breakouts is the pineapple. Pineapple’s bromelain enzyme is excellent at breaking down proteins. A similar fruit is papaya and its papaine – basically, as you eat these products, you absorb nutrients from protein-rich fruits more harmlessly, as well as glycine. This goes for eggs and their magnesium, salmon and its selenium, and beef and its zinc, among others. The bromelain in pineapple masterfully fights inflammation – at a better rate than papaya. Even professional athletes eat pineapple in order to decrease irritation in their bones. As many other fruits, it also provides you with plenty of vitamin C – almost the entire recommended daily dose of it. Still, pineapple can’t provide you with as high of an antioxidant content as some berries, but it still has a good amount of it to go around. While all these advantages may sound great, refrain from topically using pineapple, or papaya, for that matter. Papaya, in particular, has been known to exfoliate dead skin cells and boost blood flow; still, it can also irritate your skin like no other if used on location. Stick to ingesting these delicious fruits and enjoying their benefits in that way. As you probably know, citrus fruits are basically endless sources of vitamin C. From the orange, through the clementine, to the grapefruit, there is no better food if you are looking to obtain some of this goodness. For that reason, if you are battling acne, you should opt for having fresh citrus juice for breakfast or perhaps dropping some pieces into your morning cereal. A lesser known benefit of citrus fruits is their ability to deal with plentiful estrogen within your system. This makes citruses excellent aides in reducing estrogen that is obtained from various products, from food to shampoos, for instance. But how does estrogen relate to acne? Essentially, excessively high levels of estrogen diminish your progesterone. This only leads to high levels of DHT which effectively intensifies the activity of your sebaceous glands and heightens the likelihood of pimple development. If you think that this might be the cause of your acne, you can reduce your intake of foods that are high in estrogen. Nevertheless, this likely will not be enough. You also need to begin ingesting foods that break down this component – like citruses. For instance, the calcium d-glucarate in oranges performs this action like no other. Furthermore, oranges’ hesperidin, d-limonene, naringenin and quercetin can help this process along, too. Still, oranges are not the best fruit when it comes to acne, so you might want to try to opt for other citruses which have the same effects. It must also be noted that your gender is irrelevant when it comes to decreasing estrogen obtained from food, in such relatively small levels. It becomes clear that there are all kinds of important factors when it comes to clearing acne. Still, the most significant seems to be vitamin C. For example, scientists have found that people who suffer from recurring zit breakouts have about half less of the valuable ingredient. On the other hand, people who up their vitamin C intake swear by the improvement they see in their skin and general complexion. This can be due to the vitamin’s inflammation-fighting properties, as well as due to its ability to pacify tension and decrease stress. Not only can vitamin C lower the likelihood that you will be getting new pimples anytime soon, but its contribution to collagen formation can also help you deal with old traces of acne. You can obtain it from all of these various fruits, as well as others, or by adding a vitamin C supplement to your diet. Ideally, for best results, you can even do both! A good supplement product is the Garden of Life Vitamin Code Vitamin C, as well as the berry-based Terrasoul Superfoods Raw Camu Camu Powder. Is it necessary to stuff yourself with all of these fruits and supplements on a daily basis? The answer, of course, is no. Not only do you not need the vitamins from all of these products at once, but you might actually overload on sugar (even if, individually, each fruit is relatively low on this component). Do make sure to eat at least once citrus-y goodness per day. Other than that, don’t completely rely on these fruits for healing. Invest in the long-term health and well-being of your skin – eat right, watch your hormones, and reduce the stress in your daily life by exercising, spending time with loved ones, enjoying relaxing activities and traveling. While these nutrient-rich fruits cannot completely solve your skin problems, they can certainly get you on the right path to doing away with acne!